John Walker’s “The Sea No. 1’’ at Adelson Galleries Boston. John Walker’s new paintings at Adelson Galleries Boston light up the exhibition space. That’s a surprise. Walker makes paintings to be reckoned with. His largely abstract canvases and wild seaside landscapes can be broody, even confrontational, in earthy dark tones. But many of these paintings sparkle with brilliant blues, and cheery greens, reds, and yellows. Darker colors crop up and provide terrific contrast. Patterns pop. Text, which murmured a moaning incantation in previous canvases, shouts “BEANO” exuberantly along the top of several works here. 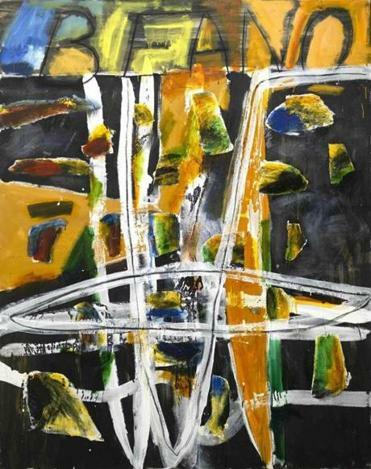 Walker, who heads the graduate painting program at Boston University, is one of the standout abstract painters of the last 50 years. He has continually challenged himself, grappling with form, collage, and text; with space and surface in abstract painting, with art history, and with his own family history. One thing has remained constant: his delight in the elemental quality of paint. He’s like a kid with finger paints, or making mud pies. He fills his canvases with smears, dollops, and grit. His passion can’t be missed. In many of these new works, he plays with stripes that fan or zigzag. “The Sea No. 1,” pulses with them, in delirious electric blue, waves rolling toward and around a peninsular form, also striped, that hangs like a net from a long horizontal splinter of green with a yellow disk — a horizon line, sun bobbing. More blue lines drop a curtain above. Walker subverts our expectations of space. Despite the horizon line, we appear to have a bird’s-eye view. 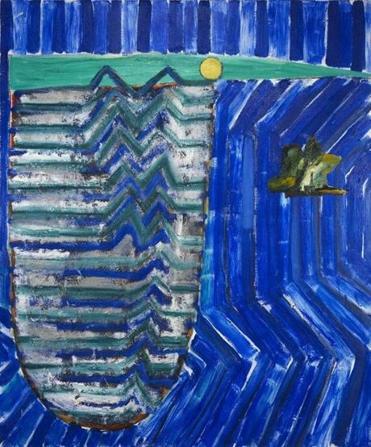 The piece’s crackling rhythm, intoxicating tones, and the artist’s loose, playful hand make “The Sea No. 1” a joyful exclamation. He found stacks of old Bingo cards in his Maine studio, a former community hall, and started to paint on the black backs of some of the cards. These dense, expansive little seascapes gleam like gemstones. Many of the cards had the word “Bingo” at the top blocked over with tape, and “BEANO” scrawled over. Walker liked the format. The vertical with a high band across matched his affection for landscapes with a high horizon line, placing the viewer at a steep, precarious perspective. In many large paintings, he, too, has written “BEANO” along the top. The titles often suggest seascapes. In “Looking Out to Sea III,” the text floats over a green sky. Below blares a grid in primary colors, more like a game board than a bingo card, and underneath float squibs and dabs of color. The grid is a shock in the work of this expressionist; it overpowers the rest of the painting, pins down all the fluidity. Under that “BEANO” banner, it’s all a game of chance. Life, painting — you don’t always win. Walker, who is in his mid 70s, keeps taking chances. That’s one reason he’s so great. Walker is a towering figure at Boston University, where he has shepherded young painters for many years. “Convergence: School of Visual Arts Alumni Exhibition” features the work of 140 artists who have passed through the school since the mid 1950s. Philip Guston was another legendary painting teacher here, in the 1970s. Like many such exhibits, “Convergence” is inconsistent, all over the place, and overwhelming. Art needs a formal or thematic context to succeed when surrounded by other art. Alumni affiliation is not enough. Sedrick Huckaby’s “Texas Dad” and “Rising Son” at BU. At a time when other art schools focus more on new media, performance, and conceptual art, BU continues to have wonderful strength in painting. Standouts here include Tirtzah Bassel’s “Trader Joe’s,” a big canvas depicting winter shoppers in line, their red carts empty, against a pastel ground. It conveys exhaustion and ennui, but the colors and spatial ambiguity — does the line go on forever? — imbue the scene with nerve. 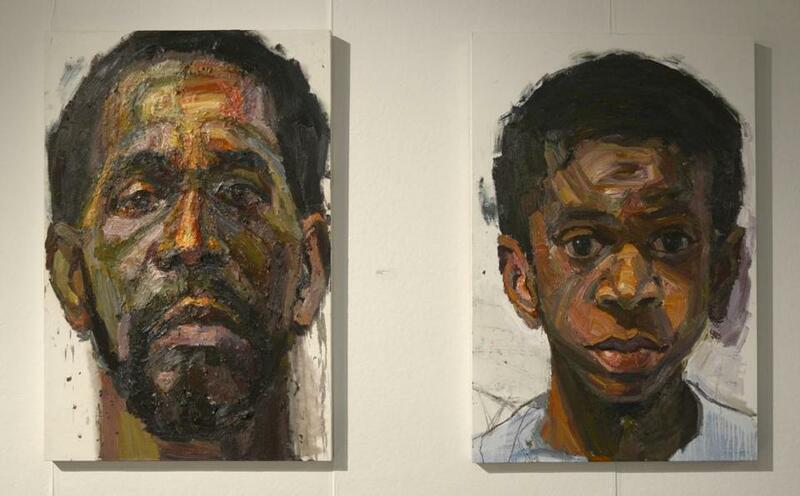 Sedrick Huckaby’s two in-your-face portraits, “Texas Dad” and “Rising Son,” hang in a pair, the brown skin tones alive with red, purple, and green. Huckaby applies his paint with deft roughness that Walker would applaud, especially in “Texas Dad,” in which the paint handling conveys the wear and tear of age. On the more abstract side, Jessica Pinsky’s “‘It was horribly unbalanced’ he said. I said ‘I understand,’” a textile, looks like a weaver’s disaster but a painter’s dream — loose threads, gawping gaps, uncertain horizontals, but a delicate and insistent grid against which soft colors warm. Nate Ethier’s nimble, eye-popping geometric pattern paintings expertly play with rhythm and color juxtapositions to leave your retina buzzing. Some non-paintings: Susan Heideman’s “Proteanna Series #15,” a lovely mixed-media print, shimmers with little bodies of lavender and blue, and the paper appears to molt in iridescent drips. David Pappaceno’s crazy resin sculpture “Grizzly Giant,” a cartoonish female form with wild patterns and a low, hooded head, looks gaudy and threatening, an embodiment of cast-off femininity.